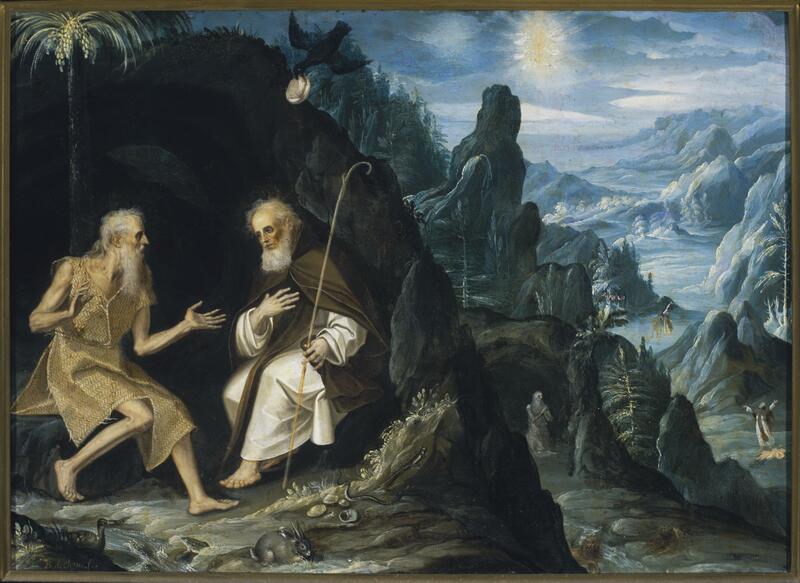 This painting depicts Saints Paul and Anthony visiting in the wilderness. While the saints fill one side of the painting and their encounter is ostensibly the theme of this work, a lush landscape dominates the other side of the painting. The inspiration for this setting probably came from Flemish landscape paintings, which were exported widely, including to Spanish America. Saint Paul, seated at left, who lived an isolated life as a hermit, wears little more than a roughly woven tunic. St. Anthony, who traveled to see him, carries the staff of a traveler. Between them, a raven descends, following narrative accounts that describe how Saint Paul the Hermit was sustained for years by bread brought by this bird. 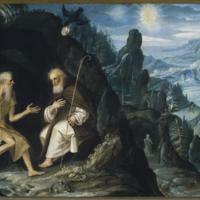 On the right hand of the painting, the figures in the landscape represent different moments in St. Paul’s life and in St. Anthony’s travels to find him. The blue-green tones of this landscape were a hallmark of Baltasar Echave Ibía, the painter of this work. Several animals appear at the saints’ feet: a rabbit, a front, a snake, a lizard, oysters and a duck. Recently, scholars have suggested that these animals may be allegories for lust and sloth and thus symbolize temptations faced by those seeking a holy life. The painter, Baltasar Echave Ibía was born in Mexico City in the late 16th century, and much of his work was created in and around the city. His family, which included his father and son, was one of the best-known painting lineages in Mexico. Echave Ibía died in 1644 in Mexico City. This painting was executed in oil paint upon a copper panel, and it measures ca. 14.75 x 20 inches (37.5 x 51.5 cm). Painting on metal was not as common in Spanish America as painting on canvas; but the technique was well-developed by Echave Ibía who first learned of it from European imports, coming into the Americas primarily from Flanders in the late 16th and early 17th centuries. This is one of several works by Baltasar Echave Ibía in the Museo Nacional de Arte in Mexico City. This image suggests how landscape paintings on copper, which were exported from Flanders to the Americas, served as model for local, Mexico City creations. Echave Ibía’s biography—as a Creole painter born in the capital city of New Spain, whose father and son also earned reputations as accomplished painters—reveals that traditions of painting production, not only iconography and style, took root in Spanish America, especially early on. Pierce, Donna, Rogelio Ruiz Gomar and Clara Bargellini. 2004. Painting a New World: Mexican Art and Life, 1521-1821. Denver. Ruiz Gomar, Rogelio, et al. 2004. Catálogo comentado del acervo del Museo Nacional de Arte, vol. 2. Mexico City: Museo Nacional de Arte. Ruiz Gomar, Rogelio. 2006. “The Hermit Saints Paul and Anthony.” In The Arts in Latin America, 1492-1820. J. J. Rishel, S. Stratton-Pruitt, eds. Pp. 335. Philadelphia: Philadelphia Museum of Art, and New Haven and London: Yale University Press. Tovar de Teresa, Guillermo. 1992. Pintura y escultura en Nueva España (1557-1640). Arte Novohispano, vol. 4. Mexico City: Grupo Azabache.